Whew! I found you! Ive been searching for these fonts along time. I really love these and I'm using these frequently.These also a trademark font used by our ORG. Thanks alot! awesome font..am i allowed to use on a contest for 99designs? This is my puppy's name. 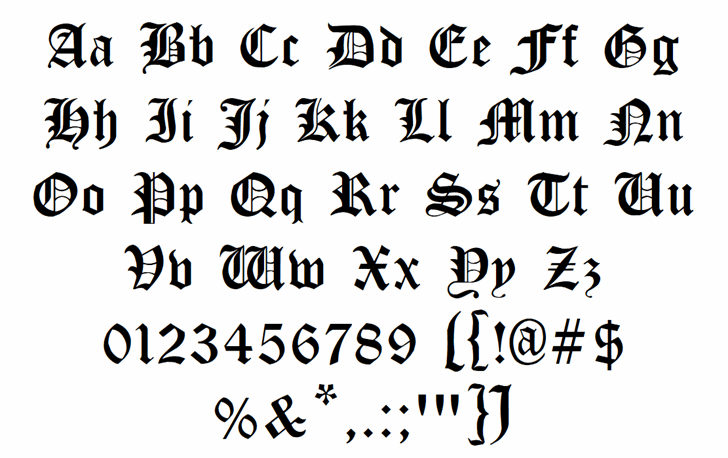 This font is SO cool; totally goth!!!!!! Cloister Black is the same font as Old English Text MT (Type Solutions Inc.1990 which I have had for years. It came with Word 2003. Please explain. Copyright (c) Typographer Mediengestaltung, 2001. All rights reserved. Full character set added by Dieter Steffmann.